At some point in the last year I fell in love with death, design and the intersection therein. I can’t recall any singular moment or event that caused this. I’d read a series of excellent books (notably Being Mortal by Atul Gawande and When Breath Becomes Air by Paul Kalanithi) and had become enchanted with the authors and their stories. I’d subsequently seen the articulate Lucy Kalanithi, doctor and surviving wife of Paul, bring a large room of people to tears as she told her story from the main stage at Medicine X. Last summer I attended a family friend’s meaningful and moving memorial, and finally attended the End Well conference (an event at the intersection of death & design) in San Francisco last December. Death is an area of healthcare that still feels very mystical. Designing for ‘end of life’ seems like uncharted territory, supporting this expedition into the unknown. For the aspects of death we do understand, there are many opportunities for improvement, starting with the plain fact that many people have trouble talking about — or even thinking about — death. I came to this work wanting to find a way to help support the overall death experience, and I also wondered whether there were opportunities for making end-of-life communication more visual. (Visualizing health is a bit of a hobby of mine.) So I decided to spend some time researching opportunities. Starting in my local community, I interviewed a nurse at a local hospice facility. She told me about people’s fears and misconceptions: that dying would be traumatic, that they would go to sleep and not wake up, that they would feel like they were suffocating. She spoke about the stresses chronic illness can put on a family, and that there is an overall fear of the unknown. She gave me a great handout (written by a VNA hospice in Florida) that describes the dying process — both the spiritual process of attending to unfinished business and letting go, and the bodily changes that indicate death is near. She told me that the handout is very helpful for setting expectations with families. Soon after these initial interviews, while at the public library, I walked by a table and saw a book lying on it called Caring for the Dying: a Doula Approach to a Meaningful Death by Henry Fersko-Weiss. It was calling my name, so I checked it out and read it. The author has pioneered an approach to dying inspired by the ‘doula’ approach to childbirth, with a special focus on planning and articulating what the experience should feel like — both for the person who is dying and their loved ones. I appreciated the book’s focus on the entire sensory experience of death; how designing the smells, sights, sounds, and tactile feelings at the end of life can create a more meaningful experience for everyone who is present. (Sensory experiences in healthcare are a special interest of mine so I found this very exciting.) A person may choose music, or quiet, or a view of the outdoors, or essential oils in the air; it is a lovely way to reclaim some control at a time when they and their family may feel powerless. I find this high-level map helpful because it shows what a dying person and their loved ones can think about and expect through the entire process. In fact the word ‘map’ seems appropriate; it’s like a guide that helps you know what to do and ask during a process in which you may be feeling lost. 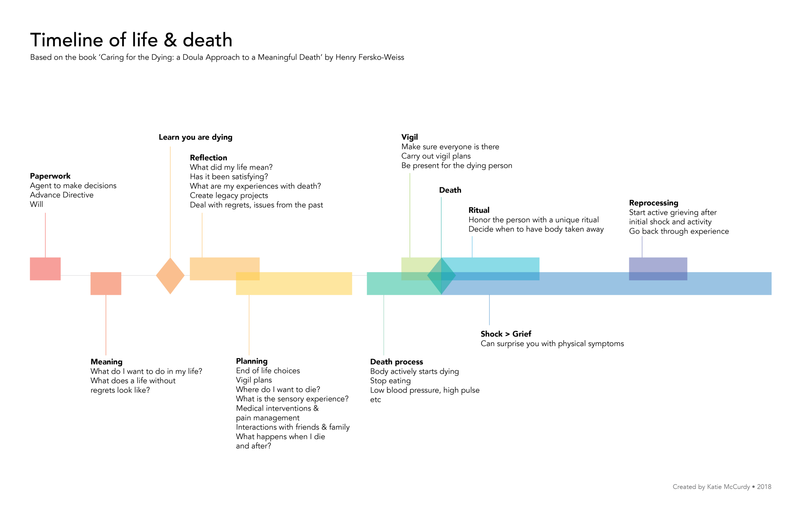 Notably this timeline begins on a very individual level, focused on the not-yet-dying person (“what do I want to accomplish in my lifetime?”), then it becomes a collective set of activities (“how should we work together to strive for an optimal death experience?”) and ends with friends and family grieving and processing the death. I → we → we without ye. This is information I know intellectually, but seeing it helps me really absorb it. It forces an empathy with the people who are still living after a death; it reminds me that it could be me who has died, and my loved ones will need to process what happened. It also helps me come to terms with the fact that someone close to me will die and I will be in grief. It helps set expectations and helps me internalize the fact that we are all on a straight path to death; only the timing is variable. I mentioned the sensory experience of dying. Looking at the death timeline, reading about the doula method of dying, and having separately done some thinking about memorials and funerals, I decided to put together a set of questions to ask my family so that we could all start to understand each other’s preferences. For lack of a better term, I called them ‘Family Questions’ and I interviewed my parents, siblings and husband to learn the answers. I will mention that I had to trick them a little bit by not revealing the purpose of these questions at the outset of our conversation. (“It’s for a project!”) But once we got into it they were fine. What did I learn? For one thing, everyone’s favorite drink is ‘water’ which I found oddly disturbing and uncreative. I loved hearing about their favorite smells (bread baking, the forest, apple pie); their happy places (the beach, the city, at home); their legacies (children, helping others, sense of humor). This information could help in the dying process; it could help in funeral and memorial planning; and it actually is great to know while we are all still alive! Knowing someone’s ‘favorites’ helps you give them more of what they love. Maybe I will be more likely to bake my mom bread or send her roses, now that I am reminded of how much she loves those smells. Recently, some life changes caused me to reconsider my work. Some projects slowed down, I had a bit of a midlife crisis, and then, suddenly, I realized that I needed to try to realize a vision I’ve had for many years. I’ve long wanted to help people see and express their health history in a more visual format. Having done this myself with great success, I wanted to bring this capability to others. It is something I want to try before I die (“try before you die” seems like another good mantra). So now, after pondering death for just a few months, I have decided to take a leave of absence from all projects and try to make this health visualization thing happen. I’m calling this new business Pictal Health. It’s a leap, but if I think of myself on my deathbed, I would like to imagine that I at least gave it a shot. So that’s what I’m going to do. Interestingly, my death research caused me to abandon the topic of death + design, at least for the time being. I think the death & dying experts out there would not be surprised at this. I’ve been reminded a few times recently of how ‘the ancients’ practiced ruminating on death, and now I see the benefits. Rumination on death causes deeper thinking about life, and not in a morbid way; it makes me feel hopeful and motivated. Kind of joyous actually. I recommend that everyone set aside time to explore the topic of death; it makes the whole enterprise feel much less scary, and spending some quality time thinking about death will inevitably change your approach to life. On that topic, my friend Kathy Kastner has put together an Instagram project called My Best Endings — she asks people to write down what they want to do ‘until they die.’ Look how much fun they are having! Source: A.A. Wright et al., “Associations Between End-of-Life Discussions, Patient Mental Health, Medical Care Near Death, and Caregiver Bereavement Adjustment.” Journal of the American Medical Association 300 (2008): 1665–73.